I am using Software version 3.16.4 on Fedora 22. The software app notified me of a system update that requires a restart. After the computer restarted I opened the software app and received a dropdown notification to review the updates. Once I closed the list of updated software, I cannot find a way to review that list again. How can I review software that I have installed, uninstalled, and updated with the Software app? Example of updates you can review only once. 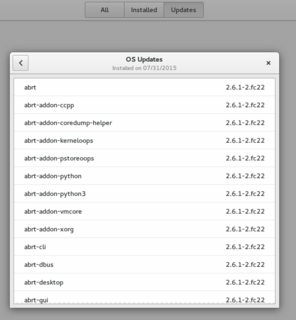 The systemd journal does list the packages updated by PackageKit. sudo dnf history is helpful to review changes I've made with dnf, but I don't see changes made by gnome-software in the list.